Setting up SSL encryption for SQL Server using certificates – Issues, tips & tricks « The SQL Dude! This entry was posted on April 21, 2012 at 4:11 AM	and is filed under Security. Tagged: configuration manager, Encryption, not starting, openssl, registry, SAN certificate, SSCM, SSL, thumbprint. You can follow any responses to this entry through the RSS 2.0 feed. You can leave a response, or trackback from your own site. Thanks for the post, very helpful. One question though, apart from the log entrywhen the SQL Service is started after configuring. How do I know that the SQL is using an SSL tunnel for all data transmission? I have run Microsoft NetMon and this has a couple of entries for the SSL handshake etc. Is there anyway other than NetMon to check that everything is encrypted? Netmon is one way, though rather cumbersome to read the netmon trace capture. Once a connection has been established you can check the DMV sys.dm_exec_connections for the value of column encrypt_option. It should be TRUE if SSL is being used for a particular session. HTH. 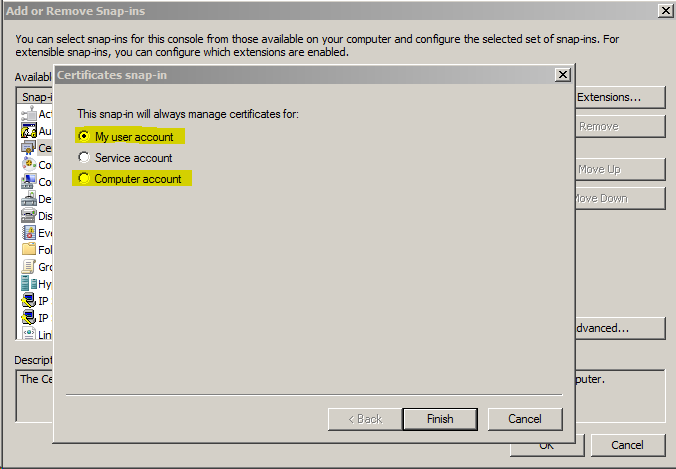 Is it possible to select the certificate using WMI instead of manually updating the registry? So, we can use VBScript + WMI provider to do this change for us. Here is a sample VBScript I wrote using the WMI Provider for registry StdRegProv to do the same thing. Save this as a .vbs file and change the values for “MSSQL10_50.INSTANCENAME” and “EnterTheNewCertifcateHashValueHere” in the below code and that should do the trick! strKeyPath = "SOFTWARE\Microsoft\Microsoft SQL Server\MSSQL10_50.INSTANCENAME\MSSQLServer\SuperSocketNetLib"
KeyPath = "SOFTWARE\Microsoft\Microsoft SQL Server\MSSQL10_50.INSTANCENAME\MSSQLServer\SuperSocketNetLib"
Wscript.Echo Chr(34) & "Certificate" & Chr(34) & " key value updated to " & Chr(34) & strValue & Chr(34) & " in ", vbCRLF & strKeyPath & "\"
Thanks! That’s really unfortunate, given that it would be a pretty cool feature. After a lot of looking around the WMI settings, I ended up modifying the registry manually as well. Congratulate you for the tutorial, I’ve been a big help. 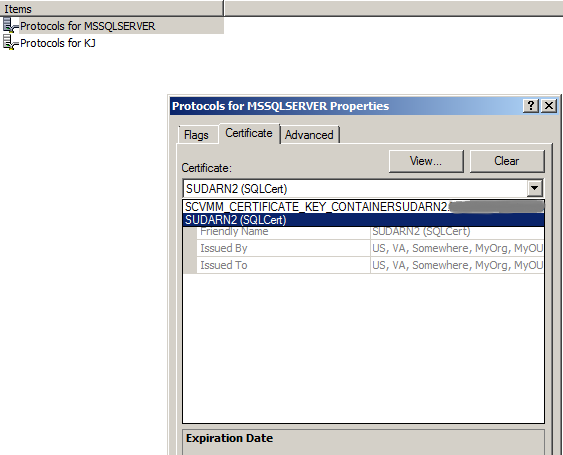 I discovered that when you connect with SSMS and do not set the encryption, also connects to SQL Server. You could always force the connection was encrypted with a specific certificate, how? This is a nice post, exactly the kind of information I was looking for. HOWEVER, I still cannot get my 3rd party CA to show up in the SSCM Certificates. I logged in using the domain service account which runs sqlsvr.exe and it is set as a local administrator on the machine. I used the cert MMC snap-in and installed it to the user’s personal store. 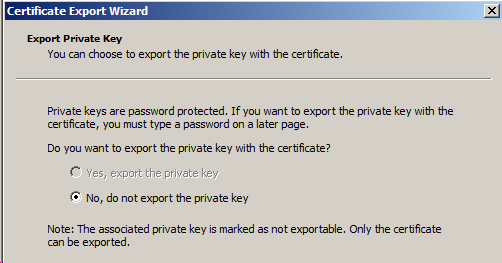 I marked it as exportable and when I check the cert properties it says ‘this certificate has a private key associated with it’. It still did not show up in SSCM. So I tried the reg hack using the sha1 thumbprint from the cert into SuperCoketNetLib\Certificate key both with and without spaces. I even ran your script, changing ComputerManagement10 to ComputerManagement11 since I’m using SQL Server 2012. It did not output any certificates. So I am currently at a loss here. Hi, I know this thread has not been active for a couple of months, but I was hoping that you could tell me how to address high time values for logins because of the SslProcessingInMilliseconds time required? We are seeing this on a single server that does not employ SSL from within SQL Server. It might be possible that some of these are SQL logins encrypted using certificates. By any chance, is this SQL Instance used as a back-end for SharePoint databases? Here is an XML snippet that contains the login timer information (I have obfuscated IP information). This is NOT a sharepoint server, but rather a database server dedicated to physical security for a site. Think ID cards and badges. That type of thing. Okay, let me review your forum post and get back. Thanks for this article and its predecessor. The detailed examples were a huge help. Let’s say we verify client encryption via sys.dm_exec_connections for the value of column encrypt_option. How do we know whether the connection is from a properly set up server/client certificate or a SQL Server “self signed” certificate?